Amish worship in the home and do not build separate church structures. 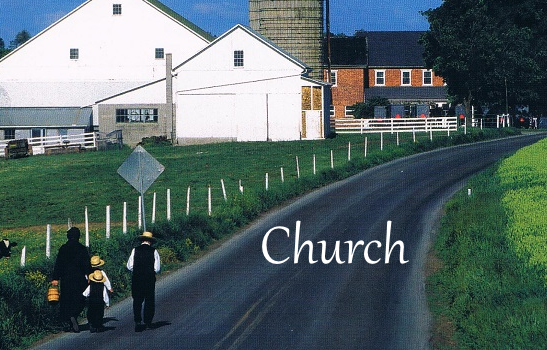 The Amish feel the basis of a church is its people, rather than a building. The benches used in church service are transported from home to home using a large church wagon (see photo below). As an exception, a few Amish do build and worship in meetinghouses. Amish communities are divided into church districts typically comprising 25-35 families. This is dictated in large part by geography, meaning districts are usually made up of close neighbors. 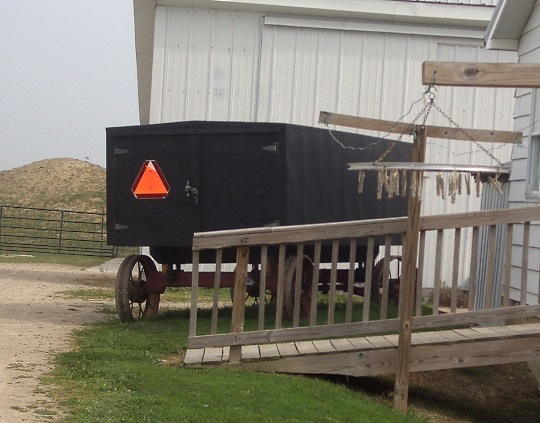 Since Amish hold worship services in the home, each family must be able to reasonably travel by horse-and-buggy to the furthest home in the district. Each church district has separate leadership, though individual districts, especially those of the same affiliation, typically cooperate with one another in various ways. Amish divide a church when it grows beyond a certain size, usually 40 families or more. The Amish practice of home worship physically limits the size of Amish congregations since all attendants must be able to fit inside a pre-existing structure at the home of each member, whether it be a room of the house, basement, shop, or in some churches, barn. A new district will be carved out of the old, taking into account geographical boundaries and member families among other factors. A new set of ministers will also be ordained. Each church district is led by a bishop, two to three ministers, and a deacon. Ministers are selected by a process combining nominations by members and the drawing of lots. In some communities, such as Lancaster County, one bishop oversees two districts. Read more on Amish church ministers and the process of ordination. How do Amish choose their leaders? Deacons and ministers are chosen from among the lay men in the congregation. Each man promises at his baptism to serve as minister if so chosen. Each member of the congregation (men and women) casts a secret vote for their choice. Those who receive a certain minimum are placed in “the lot”. The men in the lot typically draw from among a selection of hymnals, one of which contains a slip of paper with a Bible verse. The man who selects the book with verse is ordained. Bishops are chosen in a similar way from among ordained ministers. When is church service held? Unlike most Christian churches, the Amish gather to worship every other Sunday. The Sunday in-between is an “off” Sunday. On these days families may visit another church, have devotionals or Bible reading and study at home, and also spend the day visiting family, friends, or engaged in other social activities. Oversized wagons are used to transport benches and songbooks between homes in a church district. Adams County, Indiana. Typically, 2 1/2 to 3 hours, including opening and closing singing. In some groups, church can last as long as 4 hours. Church may close with a member’s meeting in which outstanding issues, such as financial needs or disciplinary matters, are addressed. What happens in an Amish church service? Amish church begins with 20-30 minutes of singing from the Ausbund hymnal. It includes two sermons, one shorter (20 min) and a second longer (one hour, each delivered by a different minister), Bible readings, kneeling prayer, and closing singing. Read an in-depth account of Amish church service. At what age are Amish baptized? Amish typically are baptized between the ages of 18 and 22, though some may be baptized as early as 16, or well into their 20s. Read more. This is an important congregational meeting which takes place in the spring and autumn, the goal of which is to affirm unity in the church and resolve any outstanding issues within the church, in preparation for the twice-yearly Communion service. Read more on Council service in the Amish church. Amish hold Communion service twice a year, on the Sunday two weeks after Council service. If the Council meeting is unsuccessful in resolving issues, Communion may be postponed. The Communion service is the longest service of the year, and can last eight hours. During the Communion service, ministers preach, reviewing the Biblical story and Jesus’ life, death and teachings. It also includes congregational affirmations of unity, footwashing, and Communion in the form of bread and wine. Footwashing is an integral part of the twice-yearly Communion service. Congregants take turns washing each others’ feet in a reminder of service and humility. Amish derive this practice from the Bible, namely passages including John 13: 1-17. More on footwashing in the Amish church. The Holy Kiss is exchanged in some churches (New Order Amish churches, for example) when male members greet one another before the church service. It is also given by the bishop to newly baptized young men, and from the bishop’s wife to the women. Women may also exchange the kiss amongst themselves in some communities. The Holy Kiss is based upon Scripture, including II Corinthians 13:12 (“Greet one another with an holy kiss”), Romans 16:16, and other passages. Read more on the Holy Kiss. Buggies parked outside a barn on Sunday. Church is happening at this Lancaster County home. This ancient High German songbook is used by the Amish at Sunday service. Songs in the book can be traced to early Anabaptists imprisoned in Germany. The second song sung is always the “Lob Lied”, or “Praise Song”. The Ausbund is the oldest song book in the world in continuous use. More on the Ausbund. Most Amish sing songs from the Ausbund songbook, which contains German-language hymns. Some Amish use other hymnbooks, such as the Unparteiische Leidersammlung or the Unparteysiches Gesang-Buch. Amish may sing English-language songs at singings outside of church or on other occasions. What does “being in fellowship” mean? Different Amish churches are said to be in fellowship when they are like-minded on what are considered important matters in the church, allowing them to cooperate on various levels. Ministers from churches which are in fellowship are typically allowed to preach in one another’s services or help settle disagreements when outside intervention is needed or desired. Intermarriage may be more likely between members of churches in fellowship. Churches may be in “full fellowship” or “partial fellowship”. Amish use the term dien to mean to fellowship with another congregation. Read more in our article on Amish affiliations. A common trope suggests that bishops control the lives of their churchmembers. While some Amish bishops can be more heavy-handed than others, the job of the bishop is not to invent arbitrary rules or unilaterally punish members on a whim. Rather, bishops are meant to serve as guiding voices for their congregants. Bishops can decide whether an issue–such as adoption of a new technology–comes up for vote, or whether the church should vote on disciplining a member. But actions are taken with the input of the lay members, and a unanimous vote is required to excommunicate a member, for example. Though many Amish have strong convictions about their own faith, they are also generally tolerant of other religious paths. Asserting one’s faith as superior to others would not be considered humble, as Amish do not claim to know God’s will. “Bloom where you’re planted,” summarizes one Amishman’s beliefs on the matter. More. Generally, no. Amish are not mission-oriented in the sense of actively seeking to convert outsiders to their faith. Amish believe in living their faith and hopefully being a good example of Christianity in practice. Amish do participate in some mission activities, however, such as charity auctions, relief projects such as hurricane re-building, mass meat-canning for the poor, and other projects. 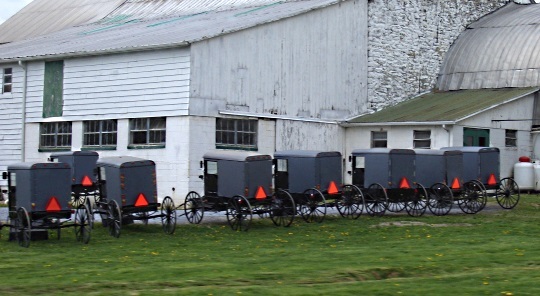 One group worth noting is the New Order Amish, a small collection of horse-and-buggy churches who are more actively mission-minded and vocal about their faith than is typical for Amish. However they also refrain from seeking converts, though some seekers have found New Order churches to be more amenable to outsiders joining. Yes. An outsider attending Amish church services is not unheard of. However, you would need to know someone in the church and receive an invitation. Some congregations are more open to this than others. Also, don’t expect to understand a lot, unless you understand Pennsylvania German or High German, the two languages used in the Amish service. Occasionally, outsiders do join an Amish church. However, converts often end up leaving the Amish as well. Barriers based on differences in daily language, technology, lifestyle, and worldview present obstacles for would-be converts. One Amish convert’s story can be read here. To Cite this Page: Wesner, Erik J. “Church.” Amish America. Erik Wesner, 25 Jan. 2015. Web. [Date Accessed]. <http://amishamerica.com/church/>.